Engines are often designed around cylinder units of a certain designed size, shape and speed. These are used as the working base of an engine, often of 6 cylinders. If more power is needed, it is easier to simply add more cylinders to increase displacement, without having to design a newer, larger cylinder and head for each engine size. Thus locomotive and marine engines like the EMD 567 come in V6 to V24 versions, all sharing the same 567 cubic inch cylinder displacement and cylinder heads. Engines are also limited by the size of the cylinder bore and stroke. While one can increase the size of an engine by simply increasing the bore and/or stroke of the cylinder, a too-large bore hurts efficient combustion, and makes for a heavy reciprocating piston mass, which limits maximum engine speed and thus power output. In a similar vein, increasing the stroke means the piston speed must be increased to match the same revolutions per minute, and this also limits the maximum size of an engine in a given weight/size range. These factors make it more feasible to build an engine of 12 cylinders and 40 liters displacement than an engine of 6 cylinders and the same size, which would have pistons too large and a stroke too long to meet the same RPM and power requirements (although it would make more torque than the 12 cylinder). In a large displacement, high-power engine, a 60° V12 fits into a longer and narrower space than a V8 and most other V configurations, which is a problem in modern cars, but less so in heavy trucks, and seldom a problem in large stationary engines. 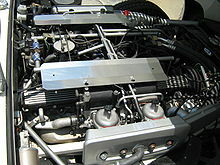 The V12 is common in locomotive and tank engines, where high power is required, but the width of the engine is constrained by tight railway clearances or street widths, while the length of the vehicle is more flexible. It is often used in marine engines where great power is required, and the hull width is limited, but a longer vessel allows faster hull speed. In twin-propeller boats, two V12 engines can be narrow enough to sit side-by-side, while three V12 engines are sometimes used in high-speed three-propeller configurations. 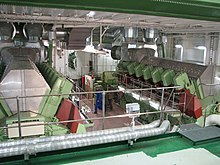 Large, fast cruise ships can have six or more V12 engines. 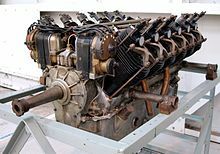 In historic piston-engine fighter and bomber aircraft, the long, narrow V12 configuration used in high-performance aircraft made them more streamlined than other engines, particularly the short, wide radial engine. 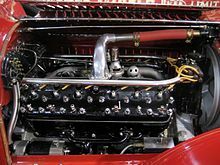 During World War II the power of fighter engines was stepped up to extreme levels using multi-speed superchargers and ultra-high octane gasoline, so the extreme smoothness of the V12 prevented the powerful engines from tearing apart the light airframes of fighters. After World War II, the compact, more powerful, and vibration-free turboprop and turbojet engines replaced the V12 in aircraft applications. In October 1913, Louis Coatalen, chief engineer of the Sunbeam Motor Car Company entered a V12 powered car in the Brooklands short and long handicap races. 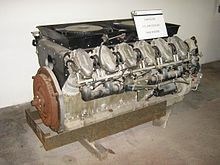 The engine displaced 9 L (550 cu in), with bore and stroke of 80 x 150 mm. An aluminum crankcase carried two blocks of three cylinders each along each side, with a 60 degree included angle. The cylinders were of iron, with integral cylinder heads with L-shaped combustion chambers. 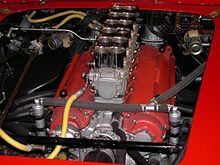 Inlet and exhaust valves were operated by a central camshaft in the V. Valve clearance was set by grinding the relevant parts, the engine lacking any easy means of adjustment. 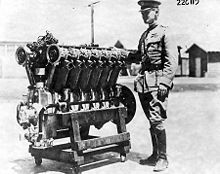 This pointed to Coatalen's ultimate aim of using the new V12 as an aero engine, where any adjustment method that could go wrong in flight was to be avoided. As initially built, the V12 was rated at 200 bhp (150 kW) at 2,400 rpm, weighing about 750 pounds (340 kg). The engine powered the car (named ‘Toodles V' for Coatalen's wife Olive's pet name) to several records in 1913 and 1914. BMW returned to V12 designs for its 7 Series sedan in model year 1986, forcing Mercedes-Benz to follow suit in 1991. While BMW sells far fewer V12-engined 7 Series vehicles than V8 versions, the V12 is marketed in the U.S., China , and Russia. 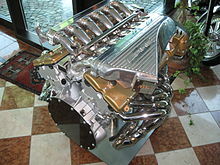 The BMW-designed V12 is used in Rolls-Royce cars, while the Mercedes engine was installed in Maybach cars. Mercedes S65 AMG, CL65 AMG, and SL65 AMG are powered by a V12 Bi Turbo engine making 463 kW (621 hp) and 1,000 N⋅m (740 lbf⋅ft) at 2,300-4,300 rpm. The CL65 AMG has a significant higher cost, but the V12 engine makes them a status symbol. 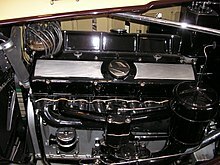 GMC produced a large gasoline-burning V12 from 1960 to 1965 for trucks, the "Twin-Six"; it was basically GMC's large-capacity truck 351 V6, doubled, with four rocker covers and four exhaust manifolds. Fifty-six major parts are interchangeable between the Twin-Six and all other GMC V6 engines to provide greater parts availability and standardization. Its engine displacement was 702 cu in (11.50 L), and while power was not too impressive at 250 hp (190 kW), torque was 585 lb⋅ft (793 N⋅m). For firetrucks the rev limiter was increased to produce 299 hp (223 kW) at 3000 rpm and torque was increased to 630 lb⋅ft (850 N⋅m) at 1600–1900 rpm. It was possibly the last gasoline engine used in heavy trucks in the US.